Pros: Great set, puppetry and effects. Does everything well, but nothing brilliantly. Still, it’s fun and it’s free! Gods and Monsters is a free theatre festival that takes place every year in The Scoop, the open-air theatre just below Tower Bridge. 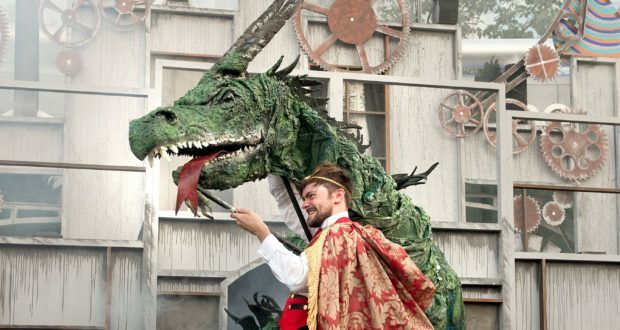 This year’s double-bill has a Slavic theme, pairing The Wawel Dragon, a family show based on a Polish myth, with a rock musical adaptation of Dostoyevsky’s Crime and Punishment. 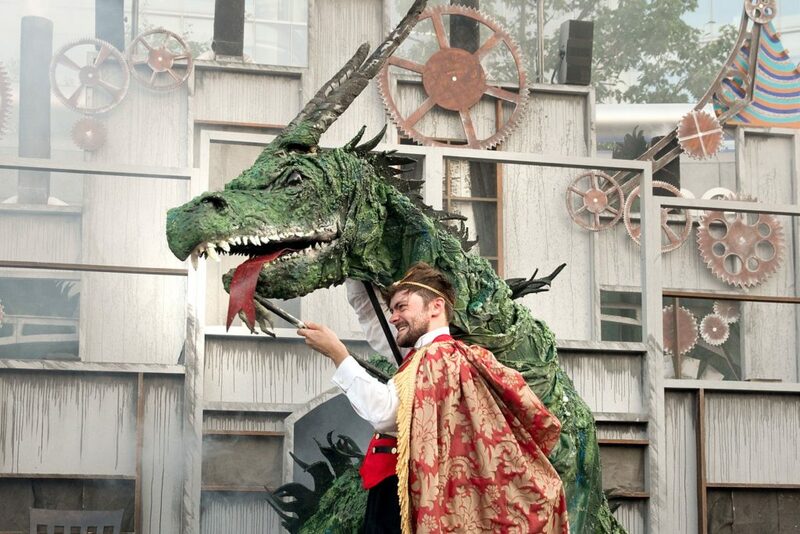 The two shows share a cast, a set and some special effects, and these economies of scale are to the benefit of The Wawel Dragon; it is a pleasant surprise to find an Off-West End children’s show with a cast as large as nine. The same goes for the freestanding set, which represents Wawel Castle and has plenty of depth, multiple levels, an array of onion domes and a few little tricks in store. Judging by the production shots for Crime and Punishment, the set looks even better after dark, when lighting is used to ‘close down’ the very wide, open stage area. However, The Wawel Dragon plays at 6pm, which at this time of year means broad daylight, a shortage of atmosphere and large areas of dead space. To judge by my quick trawl of the internet, the standard ingredients of The Wawel Dragon myth are: dragon (obviously); terrified townspeople; king who’ll sell his daughter to be rid of dragon; plucky young hero. In this Gods and Monsters version the dragon is very much present and correct, as is the plucky hero. But many other ingredients have been thrown into the mix, including a mechanical sheep, a charming princess, a wolf and a freezing sneeze. It’s a lot to cover in 60 minutes, and some of it is covered very peremptorily. I struggled to keep up with the garbled explanations of frozen hearts and men being changed into wolves, so I’m willing to bet they didn’t even register with my 7-year-old sidekick. And whilst I can’t claim to have been emotionally invested in the story or any of the characters, I was moved to cringe by the finale, which saw everyone paired off with their perfect partner; twee even by the standards of fairy tales. 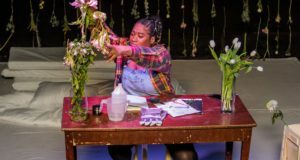 Still if the plot is a bit of a mess, it nonetheless serves as a framework for the things that this production does well: puppetry, choreography and comedy. Even though the workings of the puppet are clearly visible, the head being operated by an actor in front of the audience, the wings held up by actors behind the set, this is still a serious dragon with a big scary voice and a lot of smoke. There is also the aforementioned wolf, who is appropriately sinister and accompanied at one point by a couple of puppet backing dancers (a thing I love!) 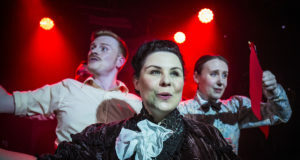 Songs, written for the show, are accompanied by dancing which is fun and varied, including some folksy jigging, some robotics and just a few jazz hands. The comic acting is a bit cheesy, and comic timing not quite as sharp as it should be. However Jasmeen James and Zac Hamilton, who are lucky enough to have the best characters and the best lines, deliver enough laughs to go around. James’ Sarafina is the haywire mechanical sheep who delivers lurid insults whenever she appears, before going all-out gangsta. Hamilton’s Prince Savrog is a narcissistic psychopath, fond of showing off his chiselled profile and making fire-related jokes; there’s a bit of Lord Flashheart about him. Free theatre is clearly a good thing. Free theatre for children probably an even better thing. We enjoyed our evening at The Scoop; my sidekick gave it a ‘that was fun’, and I’m sure we’ll go again, next time packing rugs for the rather cold, very hard seating. The Wawel Dragon boasts high production values. It’s a fun, lively show with plenty to keep eyes and ears busy. But at a time when theatre and film-makers are creating shows that operate on multiple levels, this feels one-dimensional, with not quite enough to keep the mind really busy. A commercial manager in the pharma industry, Clare dreams of doing something a bit more luvvy. She has a degree in English & French from Oxford University, and is a qualified translator. When she’s not driving thermometer sales she’s probably driving her daughters to yet another birthday party, or cleaning out the hamster. So if she occasionally slopes off for a sneaky theatre fix, it’s really the least she deserves. Her preference is for shows where she can sit down and not be expected to participate in any way at all.